Following Bharti Airtel and Idea Cellular’s footsteps to offer ‘Data Share’, BSNL has announced its new Data Sharing facility for prepaid mobile customers on PAN India basis. With this facility, a BSNL prepaid customer would be able to share the data with maximum four prepaid mobile customers of the telecom firm selected by him. The sharing of data usage can be done through BSNL Web Selfcare Portal for prepaid mobile customers. A subscriber can recharge with any of the data pack that is equal to or more than Rs 150 through BSNL Web Selfcare Portal, utilising the prepaid main account balance. However, the above facility will not be available on unlimited data STVs. 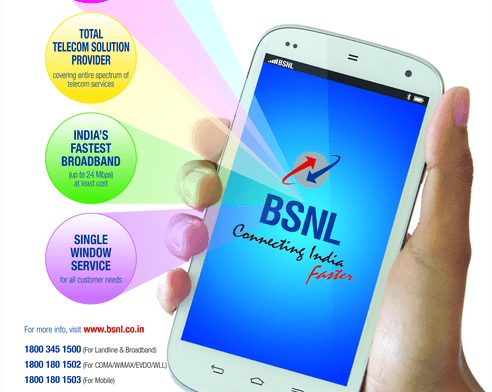 As per the latest information, BSNL South Zone users can get it first through logging in to South Zone portal– bsnlszprepaid.com, from April 6, 2016. However, BSNL hasn’t announced portal for other zones. A prepaid BSNL customer (Parent) can subscribe a community Data pack (i.e., Data STVs of Rs 150 and above excluding unlimited STVs) and share it with other 4 prepaid customers. Subscribing of community data pack and adding of Child accounts to share data – up to four numbers can be done only by Master/Parent Subscriber through the BSNL Web portal. Parent subscriber can only activate Community Data pack through BSNL portal utilizing the balance in his prepaid main account. He cannot subscribe this data plan through other channels like SMS, USSD, IVR etc. Parent subscriber must ensure availability of sufficient balance during the creation of group itself. During this process, minimum one member must be entered and a data pack must be selected. The group will be created only after deducting the corresponding amount from main account. Subsequent recharge of the data pack may be done by subscriber depending on the usage through recharge option. Parent subscriber alone can have the control over the Group account activities through the Portal. Only Parent subscriber would have access to add or delete Child accounts from data sharing feature. Both the parent subscriber and the Child subscriber can enjoy other services through recharging his account with other Top-Ups/STVs. If a child is having any other Data STVs subscribed to his/her own account, the Group account will come into effect only after his/her own data STVs get exhausted. No specific charges will be charged for adding/deleting Child beneficiaries. BSNL has partnered with Alcatel Lucent for this service. Dear readers, please share your view on this Data Sharing Facility by BSNL via comments with us. Finally got the link to create a group for data sharing. Good offer by BSNL. Let it be extended to all the Zones. It will be very useful to all the BSNL customers in south zone.